The Christmas Bird count goes on around (obviously) this time of year. I really don’t know zippity-zap about it though because, despite this blog which contains pretty much nothing but stories about birds, I’m not really a “birder.” In fact, my preferred pastime is trolling birders and others by repeatedly saying I find birds “boring,” which is funny, because it’s true. But that is not to disparage the fine art and science of birding. If anything, I don’t consider myself a birder because I’m not smart or dedicated enough. Birding is a lifelong hobby and quest requiring incredible breadth, determination, perseverance, smarts, and a willingness to travel. The best of them have a kind of encyclopedic knowledge which my simple brain is simply not capable of. Birding is for the intelligent, the adventurous, and the disciplined. Respect. But most importantly, my interest in birds ends pretty much at the dune. The birds I love, I love first and foremost because they enjoy the beach like I do. If you love the beach, I count you as a friend. For better or worse, that’s the real reason I love the birds who I love so much. The first time I ever saw a Bald Eagle sitting on the beach in Harvey Cedars years ago, I freaked. Obviously. Who wouldn’t want such a beautiful being, the national bird, to be part of their little club? But actual sightings of Bald Eagles loafing on the beaches of LBI are rare. Thanks to their astounding recovery and comeback in New Jersey (thank you NJNESP!) they are being seen far more frequently around the Island, especially in flight or perched on tall things, and the trend seems to be accelerating each year. But seeing one loafing in the Island sand, or fishing in the surf, like you and I, is still a treasure beyond words and one of those experiences you remember for a lifetime. Over the years I’ve had a handful of these experiences, but my record sighting of “2eagle” was shattered the other day with this surprise encounter at Holgate. They were just sitting around like a bunch of gulls. You could see them from the parking lot. Astounding! We love the beach for many reasons, but that magic wildness and all of the sudden surprises just waiting for us when we least expect them are a huge part of it for just about anyone who loves the coast. Here is wishing you many magical experiences having surprise encounters with amazing creatures out on the beach when you least expect them this year. The beach is alive. And we love it! Happy Holidays Jim. Thank you for sharing of yourself and your island. I hope to meet you in person one day and thank you properly. What a Christmas gift! Many thanks. Peace. Thanks, and have a wonderful Holiday. You are a good fellow Jimmy V. Look forward to seeing you on LBI later this week. SouthSide…..
Northside, Southside, it don’t matter. So impressive to see. Go Bald Eagles! Thanks. It actually is a photo. Very rare for the the illustrations in these stories. Your post was a treat to read – and the photograph truly captures that ‘treasure beyond words’ moment wonderfully. 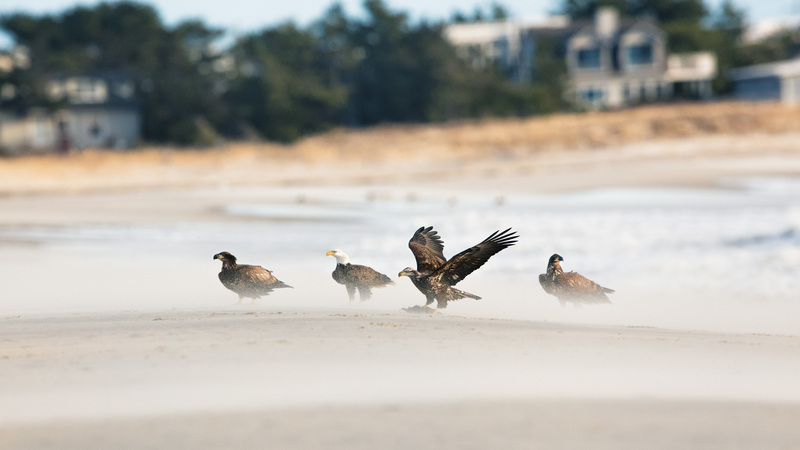 May you continue to see more eagles on your beach in 2019! Tell the eagles I’m coming to see them on Saturday!